Medicine Ball training is used in several facets to develop throwing patterns and rotational power. It is an underused tool for several age groups in their baseball development. One major tool used for both assessment and development is the “pulldown” throw. I recently posted two articles about the correlation of pulldowns to mound velocity, as well as mound medicine ball velocity to throwing mound velocity. This third part of the blog relates to the means of building intent and rotational power through “run n guns” and how the athlete’s medicine ball velocity correlates to pulldown velocity. By presenting another assessment and training tool backed by data, us coaches can build a development plan that works. What is the Medicine Ball Run N Gun? The Run N Gun is a term used to describe a throw beginning with a running start to build up momentum. This throw typically has more velocity produced due to added momentum. The footwork for the pulldown and med ball run n gun should be about the same. This test can have a learning curve, which is part of the point for using the training tool, as an athlete learns to build intent and process their movements. This movement requires the athlete to control energy transfer and put all of their intent into the medicine ball. The point of this assessment is to see how well an athlete moves and to evaluate their rotational power output. Data on this can provide a foundation for training programming to continue development for the athlete. As referenced before, medicine ball velocity can be assessed in many ways. The positional movement (mound delivery for most) is another way to find out how well an athlete moves. The Run N Gun is a better way to truly assess both intent and rotational power at its highest form. What is expected for the Medicine Ball Run N Gun? The MB RnG is used to develop intent and rotational power. The velocity production ranges between ages. For high school athletes, the average velocity was 31.4mph. For middle school athletes, the average velocity was 27.6mph. The assessment was used with a 6 pound medicine ball. The footwork varied between athletes, but they were given 15-25 feet to build up energy before release. All throws tested must be with a shot put throw, meaning staying chest height with throwing arm pushing the back of the medicine ball. For training, overload and underload weights can improve both movement patterns and intent. Video analysis should be conducted to use as a teaching tool for the athletes. As mentioned before, the style of the run n gun is up to the athlete, but it should be done with a clear focus on producing velocity. Mechanics and overcoaching can damage the intent from the athlete. The medicine ball velocity was assessed twice throughout the program. Testing included 5 throws with a 6 pound medicine ball. A shot put throw was required after desired footwork to build up momentum. Data shows the post-testing correlated to their pulldown velocity (5oz). The trendline shows an increase in throwing velocity compared to the medicine ball run n gun. 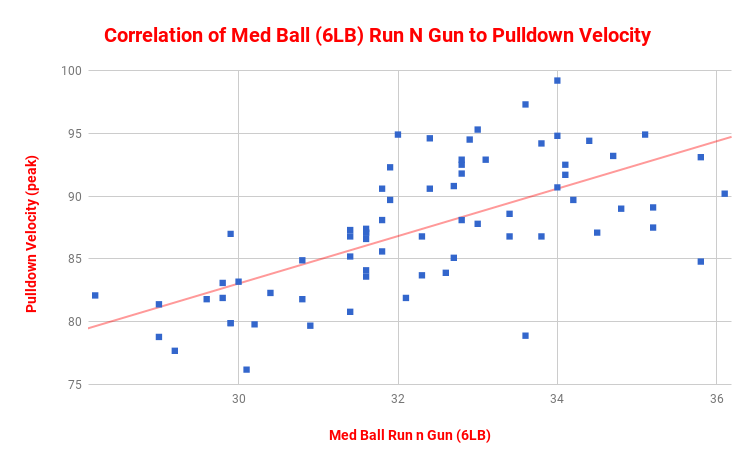 While the medicine ball run n gun can show a quick increase in velocity with some practice, the correlation to the pulldown velocity stays consistent. Assessing athletes is a key component to developing programs and proper training protocols. As mentioned before, the medicine ball run n gun is one way to assess intent and rotational power. To throw hard, you have to try to throw hard. Intent shapes more movement patterns than any drill. Now, you must learn to maximize energy development from the whole body. Often, throwers rely on the top third of their body to put force into the baseball. This means learning to rotate from the ground up. When overloading the object being thrown, the body must program itself in the best way possible. Athletes learn from the radar gun. The radar gun provides immediate feedback to each athlete specific to their intent and movement patterns. With the footwork and rotational components being so similar, the medicine ball run n gun gives both athlete and coach another assessment tool in the developmental process. Medicine ball training can be mismanaged very easily. The workload around other training modalities becomes very important to the weekly stress management. A few general guidelines are to follow. Medicine ball training can be done 3-4 times a week depending on other workload. If in a heavy volume training regimine, the volume of rotational power training should decrease. In general, the workload should be higher in the off-season compared to in-season due to the amount of high intent competition throughout the week. Choose 3-5 movements a day to focus on. At least 1-2 of those exercises should be general rotational movements, then 2-3 at a baseball specific movement. Rest appropriately between reps. This is not cardio. Each rep should be an explosive movement. Video and analyze to check movement patterns. Choose 1-2 days (depending on need) to focus on patterns/sequencing and less intent. Avoid high intent or volume medicine ball days when testing throwing/hitting velocity. Change the weight. The weight shouldn’t dictate the intent. Training one session with a lighter weight should see increased velocities and stress. Measure consistently. Velocity should be tracked weekly. When looking at the data, there is a consistent trend in those who perform a higher medicine ball run n gun to higher pulldown velocity. There are outliers. Key aspects of throwing such as arm patterning, sequencing, physical strength, and mobility can have a big effect on the correlation. But, if you are looking to choose a few specific drills that can have a direct impact on throwing velocity, the medicine ball run n gun should be one of those tools used on a consistent basis. Training with intent is a must when developing power. Throwing is a rotational movement. Developing rotational power is key to developing throwing velocity. Medicine ball training is a great tool to developing rotational power. Keep the workouts specific to what you are trying to accomplish. Medicine ball run n guns are a way to assess athletes and develop their throwing velocity.